The kidneys filter the blood and help remove wastes and extra fluid from the body. The kidneys also help control the body's chemical balance. The kidneys are part of the urinary system, which also includes the ureters, bladder, and urethra. Muscle changes and changes in the reproductive system can affect bladder control. Amount of kidney tissue decreases. Number of filtering units (nephrons) decreases. Nephrons filter waste material from the blood. The bladder wall changes. The elastic tissue becomes tough and the bladder becomes less stretchy. The bladder cannot hold as much urine as before. 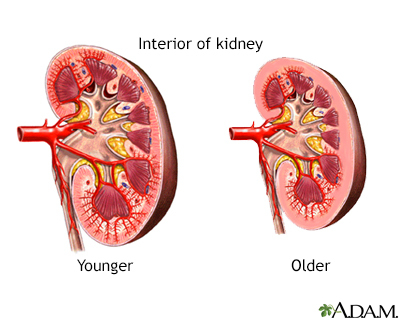 In a healthy aging person, kidney function remains normal. But illness, medicines, and other conditions can affect kidney function. Griebling TL. Aging and geriatric urology. In: Wein AJ, Kavoussi LR, Partin AW, Peters CA, eds. Campbell-Walsh Urology. 11th ed. Philadelphia, PA: Elsevier; 2016:chap 88. Smith PP, Kuche GA. Aging of the urinary tract. In: Fillit HM, Rockwood K, Young J, eds. Brocklehurst's Textbook of Geriatric Medicine and Gerontology. 8th ed. Philadelphia, PA: Elsevier; 2017:chap 22. The kidney atrophies and is not as productive with age.